The musical fountain at Slavija square, a rising star of Belgrade postcards, is officially set in motion, to the joy of all Belgrade residents and its numerous tourists. A new star of Belgrade postcards has been born. The long-awaited musical fountain, the largest one in south-east Europe, is now fully operational at the Slavija square. Belgrade has thus obtained another, entirely new symbol. This attractive fountain is going to play music twice a day, and also, the sprays of water will move in different rhythms and colours. The location of the fountain is well-known Slavija roundabout, the former infamous intersection, the place reserved for more experienced Belgrade drivers. Our opinion, however, is that the fountain is unlikely to contribute to creating more organised traffic arrangements in this roundabout. 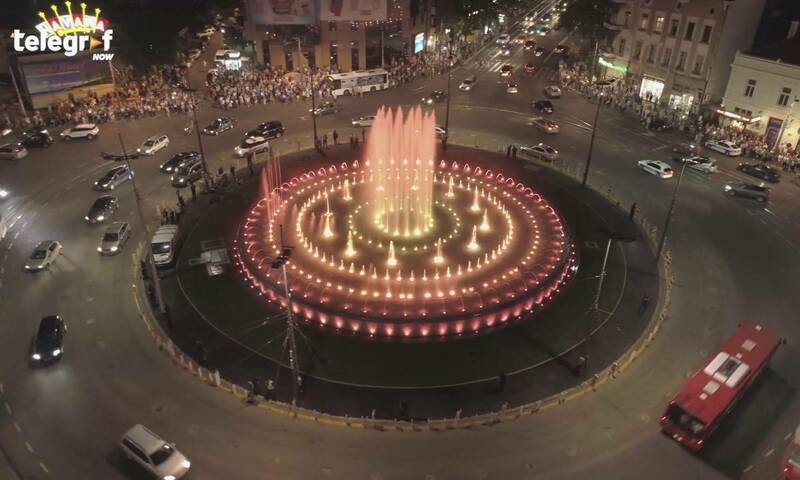 To achieve this, we’ll need to wait for other planned infrastructural works, however, the fountain will definitely bring a smile on the faces of drivers and numerous pedestrians going through this area every day. We are sure this fountain will change the everyday routine of Belgrade people and its numerous tourists. Considering its central location surrounded by several traffic lanes in the roundabout, it is regrettable that a lot of people, and children in particular, will be unable to freshen up a bit in the fountain during the hot summer days. On the other hand, such location allows superb enjoyment in genuinely spectacular audio-visual experience, and the immense size of the fountain requires that you stand and look from some distance. The Slavija fountain will be providing this spectacular audio-visual experience each day from 09-11 and 18-22, but the periods of time in between these won’t be any less rewarding. An interesting fact is that the fountain has built-in heaters so even during the winter all Belgrade residents and guests will be able to enjoy the magnificent water spray dance. We still think that Belgrade has more important projects to do, for which it is perhaps more urgent to use the budget funds, however, web site noviapartmani.com welcomes this bold decision of city authorities, as this spectacular landmark in the city will definitely meet the criteria of even the most discerning tourists. If you’re planning to stay in Belgrade, you’ll be able to be among the first visitors to enjoy this attraction. Just check out noviapartmani.com and in the section Slavija, pick an apartment which will allow you to hear, or even, see this rewarding landmark, straight from its window.